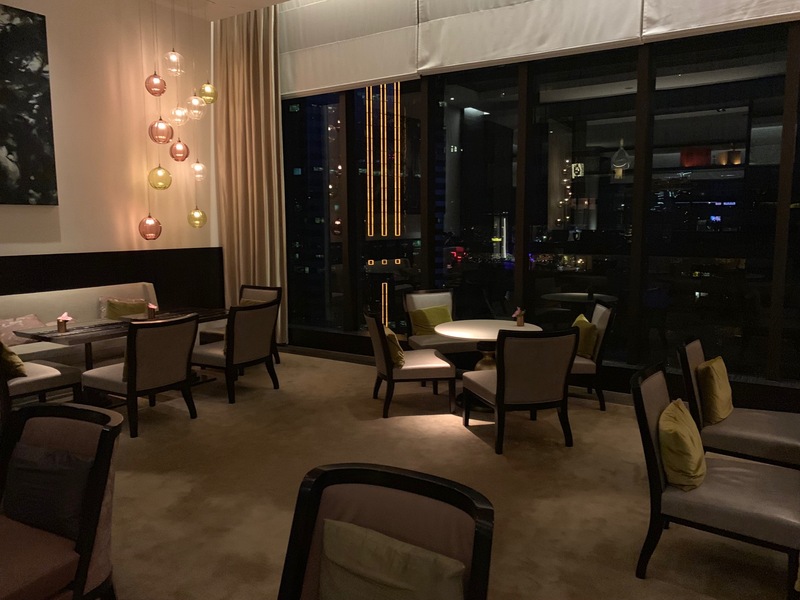 My suite in the Grand Hyatt Hong Kong proved to be the ideal venue to host meetings during a busy week at the adjoining convention center. The lobby is huge and ornate, like many Grand Hyatt properties in Asia. It was packed…but little surprise when the convention center was a few paces away. I was upgraded from a confirmed Grand Suite to a Grand Executive Harbour Suite, which I greatly appreciated. The room was the same size (65-square meters) but we had a great view of the harbor below, which my meeting participants all appreciated. As you entered the room, you walked into a long hallway with a sliding door on the left side concealing the bathroom and a door to the guest bathroom on the right. The hallway emptied into the living room, featuring a desk, L-shaped couch, coffee table, and mini-bar. The bedroom featured a king-size bed and also included a great view of the harbor below. I appreciated the oversized bathroom, which included a large shower and bathtub plus separate water closet (no Toto toilet…bummer) and walk-in closet. Privacy dividers could be lowered to segregate the bedroom from the bathroom. This property uses June Jacobs amenities. Since Hyatt Gold Passport became World of Hyatt, most hotels (in my experience) have stopped giving Globalist members any welcome amenities. I was pleased to see a bottle of wine, almonds, cookies, dried apricots, and a bowl of fruit (replenished daily) on the coffee table. A special shout out out to the maids. I don’t usually tip, but I did here. They cleaned the room twice per day and always ensured we had enough bottles of water, coffee, and tea for my meetings. The 35th floor Grand Club offered a beautiful venue with more beautiful views of the harbor. I’m not ashamed to admit that with one exception I ate breakfast and dinner in the Grand Club each day. 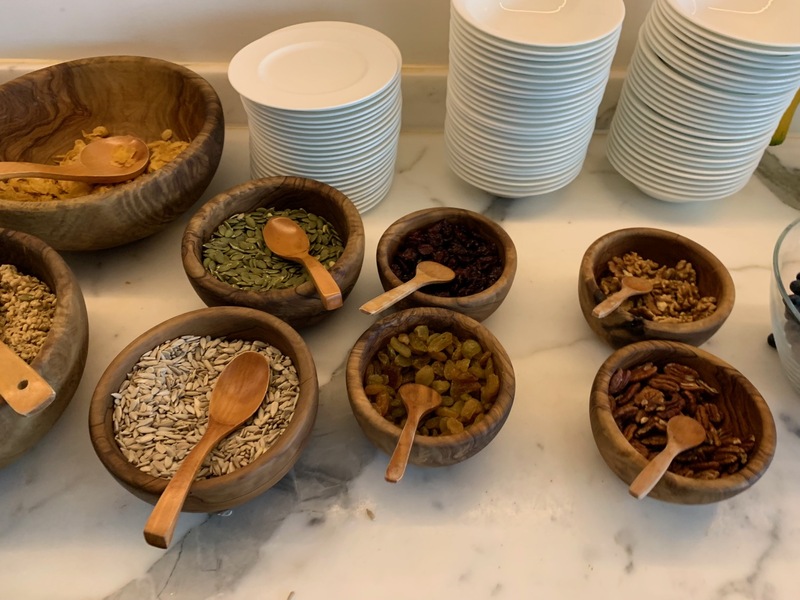 The breakfast spread is excellent, with a nice buffet and even premium items like fresh berries. Each day there is also a daily special, like poached eggs with guacamole or scrambled eggs with black truffles. Breakfast was the highlight each day. The evening spread also tasty. It wasn’t as elaborate as the Grand Hyatt in Shanghai, which is truly an entire dinner spread, but if you want take your meals here there are enough appetizers and small hot dishes to fill you up. Food is both delicious and cheap in Hong Kong, but sometimes it is nice just to stay in the hotel after a very long day. A shoutout to the excellent staff in the Grand Club. I appreciated how attentive, friendly, and engaging they were. Service was horrible. I could not believe how horrible it was. Slow is the understatement of the century. I had to practically beg the staff to order food and once we finished, I eventually had to track down a waiter by foot to sign the bill. The food was not great either. I had steak and it was average at best with a poor béarnaise sauce. That big thing that looked like a delicious mushroom was actually a clove of garlic. Even the French Fries were forgettable. Oh well. On the 11th floor, a full fitness center is available with late-model strength training and cardiovascular equipment. A tree-lined courtyard for smokers separated the gym/spa from the pool. A large pool offers great city views. I did not use the pool, but noted the November weather in Hong Kong was very pleasant. With the exception of the poor meal in the Grand Cafe, my stay was an excellent one. I am planning to return next year and look forward to hopefully the same room and same excellent lounge staff. I’ve stayed next door at the Renaissance Marriott hotel which is also a great hotel. But from these photos it sure seems the Hyatt is much more spacious, with many more amenities. I’ll give it a try next time. Could you remind us readers again what your new business venture is in again? I feel like you may have mentioned it before; Do share the type of work that requires a good amount of travel but isn’t “travel” related is pique my curiosity. So the only thing separating the smells and sounds of the bathroom occupant from the rest of the suite is a flimsy “privacy divider”? If I live to be 120 I will never understand the spread of this asinine design choice. The toilet is in a separate room. This just separates the bathtub. This is a special hotel for me… first ever Hyatt stay since I started this point and miles game in 2014. Went back 2016 as a globalist. Loved every bit of it. I also had grand suite on suite upgrade and got upgraded to exact same executive suite in the picture. Not sure if you knew, this hotel let’s globalist to have a full breakfast downstairs complementary. Wondering if they still do or not. Breakfast spread at Grand Club is nice but at the Grand Cafe, it’s at a whole new level. Best complementary globalist breakfast at any Hyatts I stayed (Andaz Maui comes at 2nd). They no longer do. I asked at check-in. I have stayed here several times and will do so again in January; however, is the pool still shared with the Marriott next door? And judging from your pictures, the construction continues outside. Have you ever stayed at the Ritz Carlton? I’m spending a week there in the Ritz Club and looking forward to the change—especially since the lobby is on the 102nd floor. Great photos, especially the harbor view which includes my old office building overlooking the harbor. Hate to see the continued reclamation of the harbor, but that is progress….i suppose. Nice review as the Grand Hyatt is indeed an excellent hotel. I also stayed at the renaissance which I think is a little more modern. Rooms seemed much nicer. Shared pool I believe between the hotels. Was packed on the Saturday with what looked like ex pats (they must sell memberships) but perfect on the Sunday. The Renaissance is much better value than the GH when paying cash; routinely 40% lower other than when a mega convention is on. When it was first opened ( 80s), before the exhibition centre was extended into the harbour, it was a great bargain. Still not bad. Plus it has the extra convenience of being closer to Star Ferry and to Wanchai MRT. The best value at GH is to use points. a “guideline” instead of an enforceable law…always, always tip housekeeping!! Hotel looks great, but my gosh, that much time in HK stuck inside a hotel the whole time sounds absolutely miserable. I hope to never find myself in that situation! BTW, I’m with Hank. I’ll never understand how the whole “open bathroom” design became a thing. Would it kill Chinese hotels to install electronic bidets? We totally love the Grand Club – Ruinart all day!